Modern day seed banks boast an extensive selection of the some of the strongest cannabis plants on Earth. Kush varieties are well known to produce potent buds and has been gaining popularity and fame over the last decade. Kush has characteristics that set this strain apart from most household varieties and have caused it to become famous as medical marijuana and popular in hip-hop culture. The specific taste and smell of Kush is often also seen as a guarantee for quality. Before every single grower on the planet knew O.G. Kush, Chem Dog and Cookies, there was a time when the Kush strain was not so well known. In this article we explain the history of the Kush strain and how it became popular one of the most popular medical marijuana strains worldwide. At Spliff Seeds we work hard to follow the latest developments in the seed world and we’d like to give you a rundown of the Kush cannabis plant. Like every other strain of cannabis seeds that is available nowadays, land races are responsible for the original genetics. Many countries host different types of marijuana landraces and in parts of the world where the weather is hot and mountainous regions can be found, fields upon fields of landrace cannabis plants grow naturally. Due to the productivity of the cannabis plant, you can find hundreds, if not thousands of years of natural backcrossing within these fields. The original Kush strain comes from one of these regions and has since paved the way for commercial medical marijuana. 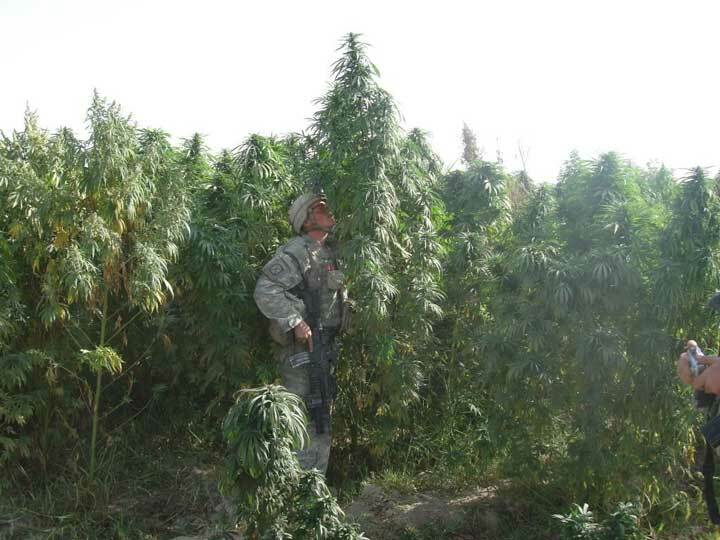 The fact that Afghanistan is one of the biggest producers of cannabis and poppy worldwide is often forgotten until pictures like this pop up. The Kush cannabis strain originally made its way to Amsterdam in the late 1970s or early 1980s. These cannabis-enthusiasts travelled through the mountainous regions of the Himalayas, Pakistan, India and Afghanistan and ended up bringing back seeds from the Hindu Kush mountain range between northern Pakistan and Afghanistan. The name Kush comes from this region and interestingly translates as “killer” in ancient Persian. Some of the most common Kush varieties known today are Hindu Kush, Master Kush and Afghan Kush. These are all original landraces taken from these locations and back crossed to find the ultimate phenotype for cannabis cultivation. After its introduction in Amsterdam almost 30 years ago many seed banks now offer a wide selection of landraces and hybrids, many of the original landrace strains can also still be found. Thanks To Our Connections In The Region, Our Afghan Bronze Line Is As Landrace As They Come! Due to years of breeding, we know the Kush cannabis plant very well here at Spliff Seeds. Kush has many pros and few cons in terms of growing difficulty and is a strain that is known by connoisseurs as high grade medical marijuana. Growers love Kush because the buds that grow on this cannabis plant are well known for being very dense and potent. Most Kush strains will grow to medium height with Christmas tree-like side branching. The fan leaves on an original land race will be thick, wide and almost counter productive in terms of how much light they block from the lowest parts of this indica variety cannabis plant. Kush varieties are usually short, stocky plants with huge leaves like the one in this picture. Kush strains grow to a medium height and stretch very little during flowering with a compact, short internodal spacing. Kush plants do very well in a sea of green setup and flower in 50-56 days, producing hard resin coated dark coloured buds. Trimming Kush strains is also very easy as the calyx to leaf ratio is extremely low in comparison to a sativa cannabis plant. Make sure you have a good carbon filter if you’re set on growing some Kush. These plants will really stink and should be controlled as much as possible, especially when drying and storing the buds! This is what gives Kush such unique selling points from a coffee shop’s perspective as well as a grower’s. The smell of this medical marijuana is unmistakable, it is often associated with jet fuel and can be described as pungent, dank and lemony. The Kush smell is often so potent that even the smallest dried bud can really stink out a room. The taste of a well grown Kush is similar to the aroma but with a jet fuel mouth wash after taste that can be tasted at every puff. Afghani farmers are very familiar with the unique taste and effect Kush varieties have to offer, which is why they have been growing this cannabis plant variety for hundreds of years. Afghani hashish is traditionally smoked while eating melon, which is said to increase the high and decrease any negative effects. Smoking a Kush joint will fill the air with thick, dank, greasy smoke. Once you have taken a few hits and have tasted that jet fuel aroma, you will begin to feel heavy eyed and almost instantly stoned. Your energy levels will drop significantly as well as your motivation leaving you feeling totally relaxed and chilled out. The THC content of Kush varieties has often been tested at over 20%, making Kush one the strongest strains around. Whilst the Dutch breeders were working hard on releasing back crossed Landraces to the public, American breeders were also working on elevating the Kush genetics to their liking. Several Kush hybrids taken from the seeds brought back from the Himalayas have circulated through America. The name 'Ocean Grown' was quickly given to an amazing phenotype that came from one of these projects, giving rise to the O.G. Kush cannabis plant that is so popular today. The exact origins are difficult to figure out even with lab research and the terpene profile is very different from its supposed landrace parents. Kush has made quite the journey from its original home in Afghanistan. It is most likely that O.G. Kush was first bred in Florida and then found its way to California. Many stories have come up over the years but we know that Californian O.G. Kush is what the American breeders call the “true O.G Kush” and dispensaries call true medical marijuana. We know that this West Coast staple also has direct ties to Florida O.G..
O.G. Kush is well known for its aroma and and potency but this is only part of the reason that the buds of this strain can be very expensive. Despite being a massively popular plant, the yields are small and the plants are finicky. Other popular relatives of O.G. Kush include a phenotype from the San Fernando Valley (SFVOG) and Girl Scout Cookies, which is a hybrid of the Florida O.G. Kush and Durban Poison F1. The famous O.G. Kush strain is enormously popular, which becomes very clear if you check the amount of known crosses on sites like leafly.com. Many medical marijuana patients in the States and all over the world find that using Kush provides strong pain relief. When smoked or used in edibles, the effects of a Kush strain are considered very medicinal and almost narcotic. Insomnia, appetite loss and anxiety are easily treated with Kush. Patients suffering from pains associated with bone, nerve and muscle can also find relief when using Kush. Medicating with Kush and a number of other indica strains has proven to be invaluable to patients with M.S., Parkinson's and numerous other illnesses. Cancer patients also enjoy the relief that Kush offers compared to pharmaceutical resources and can often eat, sleep and have normal bowel function when treating themselves with this cannabis plant. Sativa strains are probably a better choice for patients who require increased energy levels and motivation, but many patients still find Kush ticks all the boxes when it comes to anti-inflammatory and pain relieving effects. For this reason many breeders, including Spliff Seeds, are now developing Kush crosses that attempt to retain its unique potency as medical marijuana while reducing its strong couch-locking effect. Spliff Blue Medi Kush was developed together with medical marijuana users for exactly this purpose. Kush is huge worldwide but especially in Amsterdam and California. You can expect to buy a gram of the strongest kushes in Amsterdam for around €15 a gram and the buds will not be the biggest either, if you are used to large sativa buds. There was a time when haze was the main attraction in Amsterdam’s many coffeeshops. The flowering time of these haze varieties was so long that growers could ask for a higher price. With the rise in popularity of Kush, the same prices are being paid for a relatively fast-flowering strain. Growers can nearly grow two full crops of Kush in the same amount of time it takes to harvest a single Haze grow. This led to Kush being as popular amongst growers as it is amongst users. Since Spliff Seeds started in 1995 we have always been evolving and breeding new strains to meet the demands of the market. We have recently created 4 new Kush strains including a CBD rich Kush strain. These newly developed Kush strains are our Moon Walker Kush, Gold Bar Kush, Purple Berry Kush and CBD Medi Kush. The first three of these strains were developed to add onto the potency and unique flavour of O.G. Kush through crosses with some of our tastiest strains. CBD Medi Kush was specifically developed for medical marijuana and has a cannabinoid content of 8.5% THC / 8.5% CBD. We are proud to say our feminised Kush strains contain the original O.G. Kush lineage that goes back to the old school Dutch Kush plants that have been floating around Amsterdam for the last 20 years. You can expect heavy sticky pungent buds which will meet every expectation you may have! Moon Walker Kush: This hybrid is a cross of Blue Medi Kush x Skywalker O.G.. This cannabis plant stays short and bushy in the vegetative state but stretches quite a lot in flower. The Spliff team had fun making this strain as the buds are thick and chunky whilst the plants grow with a purple hue as this cannabis plant flowers. A lemony, dank Kush strain that can easily yield over 500 grams per square meter and finishes between 56-60 days. Growing this strain outdoors can also reward you with huge yields, this is best done in warmer climates due to its natural flowering time. Moon Walker Kush has excellent medicinal properties and a strong narcotic effect that can almost be overbearing to a novice smoker, this is definitely one of the favourites in the Spliff team. Spliff Moonwalker Kush is a Blue Medi Kush cross with Skywalker O.G., which makes for great taste and a fast flowering time! Purple Berry Kush: This hybrid of Spliff Strawberry x O.G. Kush is our highest yielding Kush strain. The lowest parts of this cannabis plant will be as productive as the top half, producing bud sets all over in thick clusters. Its strong side branching character and thick stems make this a great strain for anyone looking for a very reliable plant with sweet berry flavours and a Kush edge. You can expect this strain to finish flowering and be ready to harvest within 60 days, with large fruity fluffy crystal soaked buds. Growing Purple Berry Kush outdoors is also extremely productive in warmer climates. Purple Berry Kush combines the best effects from both parents and will have you energetic and very relaxed at the same time. We spent years looking for the best phenotypes and we’re very excited we’re finally able to offer this wonderful strain to our customers. Purple Berry Kush combines the sweet taste and clear high from Spliff Strawberry with everything we love about O.G. Kush. Gold Bar Kush: This strain was developed for the connoisseurs out there and produces pure gold in terms of the high, flavours and smell. If you love Tangie or Diesel then you will love this hybrid of Medical Kush x Orange Bud, as this strain has a very prominent sour apricot taste and produces smaller buds of the highest caliber. This strain is one of our lowest yielding Kushes and takes around 65 days to finish, but the unique flavour and balanced effect are well worth it. Gold Bar Kush was developed with a focus on quality and taste, making it ideal for real cannabis connoisseurs. Smoking this strain provides a mix of an intense high and medium stone that keeps you smoking this one all day long. Gold Bar Kush has a unique sour apricot aroma and balanced high. Its unique terpene profile makes this Kush variety very popular in the extract community. CBD Medi Kush: Spliff Seeds created our first ever CBD medical marijuana strain to keep up with the ever changing scene and the numerous medical benefits of CBD. We crossed our Blue Medi Kush x Amnesiac x CBD Afghan to create a wonderful strain of medical marijuana. The result is a Kush strain with a perfect 1:1 ratio of THC and CBD that is perfect for smokers who are seeking a relaxing stone but not so much THC. CBD Medi Kush provides all the medical benefits of marijuana without the racing thoughts or anxiety associated with high THC levels. With good yields of fruity, dense nugs that finish in 60-65 days, we like to think we’ve developed one of the best medicinal marijuana strains on the market! CBD Medi Kush was developed to have equal amounts of THC and CBD, making it the perfect medicinal marijuana strain. At Spliff Seeds, we like to know as much as possible about our strains and enjoy sharing the history of the cannabis plant with anyone that might be interested. We hope you enjoyed this backstory and that you have as much fun with the Kush cannabis plant as we do!